Yearning For More of God's Spirit In Your Life? It doesn't matter who you are, what you've done, or what your life experiences have been - Your Heavenly Father has a plan for your life! His desire is for you to have a relationship with Him where, in the stillness of your time together, He can gather all of your broken pieces, and reshape you into His very own masterpiece. Deep within your heart, this is the kind of intimacy with God that you're thirsting for. And, you can begin building that deeper relationship with Him today through this powerful program! "This is a wonderful way to really build your personal relationship with God. The program really helps you focus on what's important!" Discover the two fastest ways to enter into the presence of God (Week 6). Find out why Satan doesn't want you to feel forgiven, and how to truly see yourself as righteous (Week 8). Learn the names of God used in the Bible, and what each one reveals about His desires for you and your destiny in Him (Week 3). Learn why Satan would rather have you try to hide life's pains deep inside your heart than confront them head on (Week 7). Find out how to force your thoughts and emotions into submission to the Holy Spirit of God and His will for your life (Week 10). "A Personal Answer to a Cry From the Heart..."
"You clearly show that there is a process that I must be willing to go through to experience the joy and reality of being fully yielded to the Father’s will and plan for my life. This Bible study book has boosted my faith in God, helped me to understand more deeply God's love for me and given me simple, definitive steps to assist in my knowledge of and appreciation for God as Abba, Father. ...Without a doubt, an effective tool for experiencing intimacy in our relationship with God! " "I am ready to deepen my relationship with God! Show Me How To Truly Connect With Him..."
Has Your Spiritual Growth Gotten Lost In The Shuffle? As a 21st century Christian, it's harder than ever to develop a thriving relationship with your Heavenly Father. During a time when I faced these same challenges in my own life, I sought God for how it was possible to really connect with Him in the midst of the chaos I felt so lost in. I discovered that, by investing about an hour a week into my Christian spiritual growth, I could open the door for God to totally transform me. And, Praise God, He did it, and has been doing it ever since! Discover the 4 most common road blocks standing in the way of Christians connecting with God, and how to break them down 1 by 1. If you are anything like me, you don't want to settle for the average Christian walk - Something inside of you wants more! I truly believe in my heart that is why God has brought you here. What did I do with that hour that I invested into my spiritual walk? I studied God's Love Letter to Me - The Bible - At Least Once a Week. I Committed to Spending Time with Him in Prayer Each Day. I Meditated on His Promises daily, and Hid them in My Heart. Those are the three steps that I used to develop a closer more intimate relationship with God, and I believe in my heart that they will work for you to. Becoming God's Masterpiece is not just a Bible study book. What makes this program so powerful? It's definitely not me! The three transformational steps - Study, Prayer, and Christian Meditation - work together to open up the door for God's Holy Spirit to move in your life. Throughout the course, you will uncover the very Bible truths God revealed to me that have changed the way that I look at myself, and the way that I look at Him, forever - And they will do the same thing for you! You will discover how to invite Your Heavenly Father into your life so that He can begin mending those broken places, and shaping you into His own work of art. Invite God's Spirit Into Your Life - And Be Transformed! "...let the Spirit renew your thoughts and attitudes. Put on your new nature, created to be like God—truly righteous and holy" (Ephesians 4:23-24 NLT). Discover how to apply God's Word to your everyday life. Develop a deeper prayer life and a stronger relationship with God. Take God's Word from your head to a deeper level in your heart. Discover the true purpose of your creation, and how to fulfill that purpose on a daily basis (Week 2). Find out if your relationship with your earthly father may be hindering your relationship with God, and how to stop it once and for all (Week 5). Uncover why Adam really hid himself in the garden, and find out if you may be hiding from God without even knowing it (Week 7). Find out how to forgive the unforgivable, and open up the door for God to heal the wounds they caused (Week 9). Discover what it really means to be a living sacrifice, and exactly how to do it (Conclusion). "I want more of God's Holy Spirit working in my life! Show Me How To Let Him In..."
"I Had Felt Distant and Unworthy..."
"This program simplifies the understanding of who God is and what He wants for my life. During the start of my life as a Christian, at times I had felt distant, unworthy or "left out" of the experience that other Christians around me were having. They seemed to be connected with God while I felt like I was constantly reaching but could not grab hold. This Bible study book breaks down the walls and draws us closer to our Creator, and helps us to connect with Him on a personal level. " I know personally that taking the first step towards deepening your walk with God isn't easy. So, I want to reward you for making the decision to put a priority on your Christian spiritual growth! I have hand-pick books that I believe will take the things you will be learning in your Bible study program to the next level. Each one of these free Christian eBooks helps you break down a different stumbling block that can keep you from truly connecting with God. They are my free gifts to you, and I believe they can help you in your journey to becoming the YOU God created you to be. Called One of the Top 10 Christian Books in the World! "Here is a masterly study of the inner life by a heart thirsting after God, eager to grasp at least the outskirts of His ways, the abyss of His love for sinners, and the height of His unapproachable majesty." "By spiritual union with the living Lord Jesus, every Christian has the provision to be at 'rest'... In the midst of temptations and the trials of life, Christians can experience the "rest for their souls" (Matt. 11:29) that Jesus promised." "Arnold lets the untidy experiences of ordinary people speak for themselves—people who have earned the right to talk about overcoming hurt, and about the peace of mind they have found in doing so." Start Becoming God's Masterpiece Today Risk Free! You'll Love It...Or You'll Keep The Books For Free! 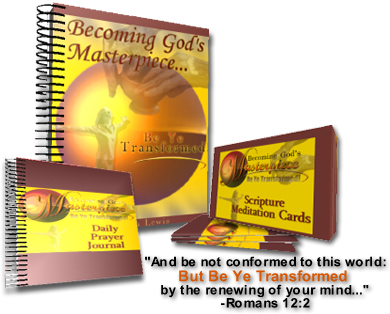 I really pray that you are blessed by the Becoming God's Masterpiece Bible Study Program, and that God uses it to transform your life in a very special way! If you have any questions that need answering, please don't hesitate to contact me. "Ameerah, I want to be transformed by the renewing of my mind! Show Me How To Let God's Word Really Change Me..."
*All eBooks available for immediate download in PDF Format upon payment through ClickBank. Depending on computer speed, download times may vary. P.S. 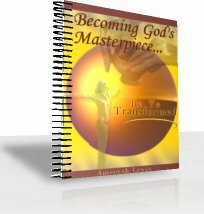 For less than the price of a DVD - Just $12.95 - you can invite God into your life to begin transforming you into His very own work of art! I really want to encourage you to make your Christian spiritual growth a priority in your life. 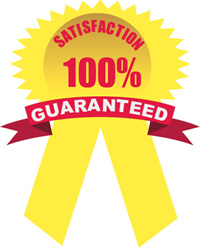 That is why you have a 56 day money back guarantee - I want you to have absolutely nothing to lose, and everything to gain! "I'm ready to truly become a living sacrifice! Show Me How To Truly Yield To God..."